Under the so-called "Savchenko law", he has served most of the term. 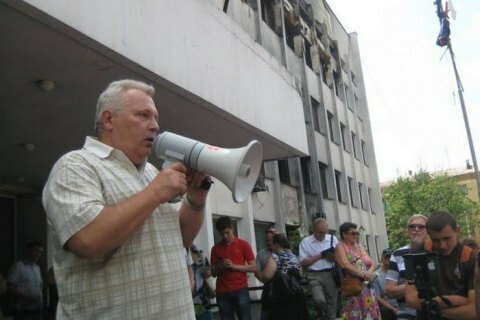 Mariupol's Zhovtnevyy district court on 28 December sentenced a local resident, Oleksandr Fomenko, to six years and nine months in prison. On 1 June 2014, Fomenko proclaimed himself a "people's mayor" of the city. The court found him guilty of separatism and seizure of power. Fomenko was in a remand centre from 12 June 2014 to 20 June 2017. The court will take this into consideration under the now defunct "Savchenko law" that counted a day in a remand centre for two in prison, which means that Fomenko has served most of his term. A local media portal said that Fomenko partially denied his guilt. He said that all his life he had been engaged in public activities and taken part in every rally in the city. When the people present at the rally offered him to become a new "mayor" he had no choice but agree, he added. The defendant also said that he had never been acquainted with anyone in the separatist Donetsk People's Republic, learnt about it on the Internet and simply called for the creation of a controlling body for the city authorities. Fomenko called himself a citizen of Ukraine and insisted that he did not seek the establishment of other "republics". After considering the testimony of witnesses and Ukrainian servicemen who took part in the detention of the "people's mayor," the court found him guilty. Fomenko's defence may appeal the verdict.